EVERY YOUNGSTER DREAMS OF BECOMING ENGINEER, DOCTOR, LAWYER, MBA, MCA, CA, etc. BUT HAS ANYONE AMONG US THOUGHT OF BECOMING A PRAHLAD, A MEERA, A TUKARAM, A SAKUBAI, A DHRUVAN, A JAYADEVAN, OR ANY OTHER BHAKTHA. NO SURELY NOT.WHY WHAT IS THE REASON? THE MENTALITY OF TODAYS YOUTH IS RESTRICTED IN CONSIDERING MATERIALISTIC PLEASURES OF THE UTMOST IMPORTANCE. IF ASKED TO CHANT LORDS NAME WHAT WOULD BE THEIR REACTION? NO I'M NOT SO RELIGIOUS. I DONT WANT TO GET INVOLVED IN ALL SUCH THINGS. IT SOUNDS VERY ORTHODOX FOR ME. I DONT WANT MY FREEDOM TO GET RESTRICTED etc. ALL SUCH SILLY EXPRESSIONS ARE BECAUSE NEITHER THE YOUTH NOR THE EXPERIENCED HAVE REALISED THE POWER OF NAMAJAPAM. WE OURSELVES ARE THOSE YOUTH WHO HAVE PASSED THROUGH ALL THESE STAGES AND WHO WERE SEARCHING FOR HAPPINESS EVERYWHERE BUT THE DAY WE GOT OUR GURUJI HE MADE US REALISE THAT WE WERE IN A DREAM WORLD, BROUGHT US OUT OF IT, SHOWED THE PATH OF REAL HAPPINESS WHICH WAS NAMAJAPAM. TODAY WE ARE ABLE TO PRESENT THIS ONLY BECAUSE OF THE GRACE OF OUR GURUJI WHO MADE US REALISE THE REAL HAPPINESS. TODAY WE HAVE WRITTEN EVERYTHING YET NOTHING. EVERYTHING CANNOT BE EXPRESSED THROUGH WORDS IN LIFE. JUST AS A TASTE OR FRAGRANCE CAN BE EXPERIENCED AND NOT EXPLAINED SIMILAR IS THE CASE OF NAMAJAPAM. ANOTHER SIMILE IS ACHARYAN WHOSE PRESENCE AND COMPANY CAN ONLY BE EXPERIENCED BUT NOT ELABORATED. EXPERIENCE AND FEEL IT FOR YOURSELVES!!! ALL HIS TEACHINGS COMPILED IN ONE SECTION. HENCE NAMASANKEERTHANA MEANS RECITING THE LORD'S NAME CONTINUOUSLY. IT IS MOST EASIEST AND COMFORTABLE WAY TO ATTAIN KRISHNA IN KALIYUGA. LORD KRISHNA IS IN THE FORM OF NAMASANKEERTHANA IN THIS KALIYUGA, AS HE HAS A LOT OF COMPASSION FOR THE SAMSARIS. HE KNOWS THAT, IN THIS AGE OF KALI, PEOPLE'S LIFE SPAN IS SHORT, THEIR THINKING PROCESS IS BLUNTED, THEY DON'T HAVE GOOD AND WISE THOUGTS. THEY DON'T HAVE TIME TO PERFORM MEDITATION, YAGNAS,OR ARCHANAS. HENCE HE TOOK THE "AVATAR" OF "NAMASANKEERTANA." KRISHNA IS NOT DIFFERENT FROM HIS NAME. HENCE CHANTING HIS NAME CONTINUOUSLY IS AS GOOD AS BEING WITH HIM CONTINUOUSLY. EVERY INDIVIDUAL LIKES SOME KIND OF MUSIC OR SONG AND KEEPS ON HUMMING IT CASUALLY.BUT SUCH MUSIC OR SONG CAN GIVE MOMENTARY PLEASURE. IT IS NEITHER BENEFICIAL NOR IT CAN GIVE ANY KIND OF REAL HAPPINESS. INSTEAD, IF WE KEEP ON HUMMING LORD'S NAME IT IS NOT ONLY BENEFICIAL BUT ALSO GIVES US REAL HAPPINESS. CHANTING THE LORD'S NAME DOESNT MEAN SACRIFICING WORLDLY PLEASURES OR GETTING DIVERTED FROM OUR RESPONSIBILITIES. NAMASANKEERTANA IS THE ONLY WAY TO PERFORM OUR DUTIES PERFECTLY. NAMASANKEERTANA GUIDES US IN EVERY PATH OF OUR LIFE. IT MAKES US FEEL THE REAL HAPPINESS HIDDEN IN EVERY SMALL THING IN THIS WORLD. NAMASANKEERTANA HAS THE POWER TO DESTROY ALL OUR SORROWS AND GIFT US HAPPINESS. ONCE WE EXPERIENCE THE REAL TASTE OF NAMASANKEERTANA WHOLE HEARTEDLY THEN THAT IS END OF OUR SUFFERINGS. IT REMOVES ALL OUR EVILS AND AT THE SAME TIME DOES GOOD TO US. THE PRE REQUISITE FOR DOING NAMASNKEERTANA IS MIND. THERE ARE NO RESTRICTION PLACED ON DOING NAMASANKEERTANA. IT CAN BE DONE BY ANYONE , ANYWHERE, AND AT ANYTIME. IN OUR DAY TO DAY LIFE IF WE UTILISE ANYTHIING IT REDUCES. FOR INSTANCE THE AMOUNT DEPOSITED IN THE BANK REDUCES AS WE UTILISE IT. BUT, ITS NOT THE CASE WITH NAMASANKEERTANA. AS MUCH AS WE UTILISE, IT GOES ON INCREASING AND SIMULTANEOUSLY ITS BENEFITS ALSO INCREASES. 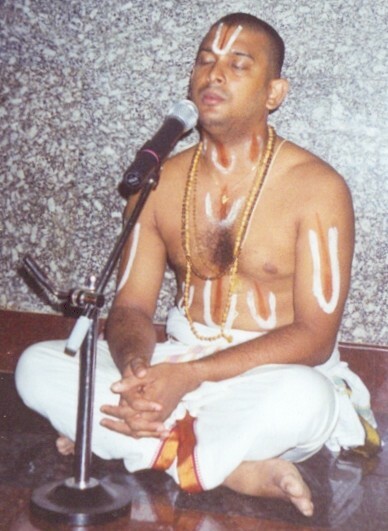 A TRUE SATHGURU IS REQUIRED WHO WILL TEACH NAMASANKEERTANA TO THE SAMSARIS. ATTAIN A SATHGURU CHANT CONTINUOUSLY AND BE HAPPY. THE MATERIAL WORLD IS JUST AN ILLUSION, EVERY THING IS TEMPORARY. IS IT VERY DIFFICULT TO CHANT TWO WORDS "RA--MA", "KRISH---NA" ? WE SPEAK SO MANY USELESS WORDS EVERYDAY THEN WHY CAN'T WE CHANT THESE TWO WORDS? IT IS ALL A QUESTION OF MIND. DIVERT YOUR MIND TO NAMASANKEETANA, DO ALL YOUR DUTIES PROPERLY, THE SUPREME WILL CERTAINLY REWARD YOU, THERE IS NO DOUBT ABOUT THIS.
" NAAMASANKEERTANAM YASYA SARVA PAAP PRANASHANAM PRANAAMO DUKHA SAMANAHA TAM NAMAMI HARIM PARAM." SATHGURU IS THE MESSENGER OF LORD KRISHNA WHO SHOWS US THE PATH FOR ACHIEVING THE REAL HAPPINESS AND BHAKTHI BECAUSE THERE IS A HUGE RESERVE OF HAPPINESS AND BHAKTHI WITH SATHGURU HIMSELF WHICH NEVER REDUCES UNDER ANY CIRCUMSTANCES. SATHGURU LIFTS US TO A HIGHER POSITION, GIVE US HIGHER ENJOYMENT AND BRINGS US FROM DARKNESS TO LIGHT.HE IS THE DESTROYER OF ALL OUR SUFFERINGS. HE RECOGNISES THE CRY OF OUR SOUL. ALL THE RELATIONS EXISTING IN THIS WORLD ARE LIMITED TO OUR BODY BUT THE ONLY ONE FOR OUR SOUL IS OUR SATHGURU .IF ONE IS UNDER THE SHADE OF GURUKRIPAI HE CAN FIGHT AGAINST ANY ODDS.WE AS INDIVIDUALS ARE DROWNING IN THIS WORLDLY OCEAN(SAMSARA SAGARAM). ON BOARDING THE SHIP CALLED SATHGURU ONE CAN EASILY OVERCOME THIS SAMSARA SAGARA. THE GREATNESS OF SATHGURU CANNOT BE DESCRIBED WITH MERE WORDS. TO DO CONSTANT DHYANAM OF SUCH A SATHGURU SHOULD BE THE SOLE PURPOSE OF OUR LIFE SO AS TO ENJOY THE REAL HAPPINESS AND TO FIGHT AGAINST ALL ODDS. SO ARISE, AWAKE AND ATTAIN A SATHGURU. DOING NAMAJAPAM AND BEING UNDER THE SHADE OF A SATHGURU DOESN'T MEAN BEING A SANYASI. THUS IT COULD BE SAID THAT THE SOUND FOR THE SOUL IS NAMASANKEERTHANA AND THE SEARCH OF THE SOUL IS SATHGURU. "GURU BRAHMA GURU VISHNU GURU DEVO MAHESHWARAHA GURU SAKSHATH PARABRAHMA TASMAI SHREE GURAVE NAMAHA"
HINDUISM IS A SANATHANA DHARMA. EVERY CONCEPT OF HINDUISM IS A TRUE FACT TESTED AND RESPECTED FOR CENTURIES. EVERY SCIENTIFIC DISCOVERY AND INVENTION WAS HANDED OVER BY HINDUISM TO THE PRESENT DAY WORLD.VEDAM IS THE BASE OF HINDUISM. HINDUISM DOESN'T MEAN A RELIGION ,IT'S ONLY A WAY TO LEAD A HAPPY AND PROSPEROUS LIFE .TO BE FRANK THERE'S NOTHING KNOWN AS RELIGION IN THE HINDU VOCABULARY.HINDU MEANS AN INDIVIDUAL WHO IS SINCERE IN HIS OR HER DUTIES. SO HOW MANY HINDUS ARE REALLY HINDUS? INDIA IS NOT BHARATA BHOOMI AS MANY SAY BUT BHAGAVATA BHOOMI. THIS SACRED LAND HAS BEEN LAND FOR ALL THE GOOD DEEDS ON THIS EARTH RIGHT SINCE DAY ONE. DEVOTEES WERE PRESENT, ARE PRESENT AND WILL BE PRESENT IN EVERY NOOK AND CORNER OF THIS PUNYA BHOOMI. IN EVERY STAGE OF EVOLUTION THIS LAND HAS SEEN AND BEEN CULTURED BY SCORES OF BHAKTHAS.EVERY SECOND A BHAKTHA IS BORN SOMEWHERE OR OTHER IN OUR COUNTRY.DIVINE HYMNS AND SCRIPTURES ALWAYS RESONATE IN BHARATA BHOOMI. THIS IS THE ONLY COUNTRY WHERE GODS THEMSELVES WILLINGLY INCARNATED, RULED WISELY AND ALSO SENT HIS BHAKTHAS FOR THE WELFARE OF THIS PAVITHRA BHOOMI. THIS LAND SHOULD REGAIN IT'S GLORY AND PROSPERITY.THE LAND WHICH HAS SEEN THE REIGN OF RAMA AND KRISHNA WHEN PEOPLE WERE UNKNOWN TO ANY MISERY IN THIER LIFE. THIS IS THE ONLY EXPECTATION FROM ALL OF US. THESE ARE SOME OF THE TEACHINGS OF OUR GURUJI . RELISH THIS UNTIL WE COME OUT WITH THE REST IN THE COMING ISSUES.